It's the hottest ticket in American Jazz! Your value pass to discovery! The Club Pass is RIJF's unique pass that gives you access to up to all Club Pass Series shows June 21 - 29, 2019 at the festival's 12 official Club Pass Series venues. 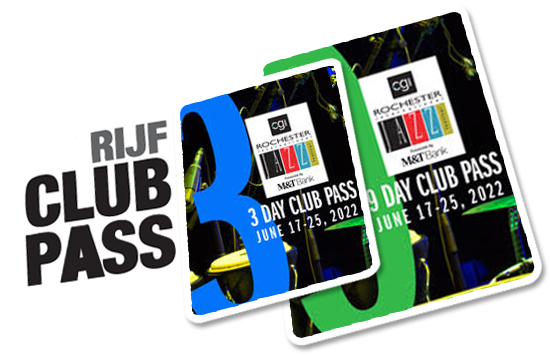 The CGI Rochester International Jazz Festival Club Pass is a unique value pass that allows you to sample music from some of the finest artists from throughout the world, Come and go as you please from 220+Club Pass shows at 12 official Club Pass venues and save off the individual entry cover charges of $35 for Kilbourn Hall and $30 at all other Club Pass venues. If you use your pass for just two shows a day for nine days, the individual ticket cost would be almost $600. Most people attend an average of five shows a day. The savings add up, and you have the freedom and flexibility to see as many shows as you want each day. Just show your Pass at the door and enjoy the music! The Club Pass is a great gift and perfect for entertaining clients and business associates at Rochester’s signature summer event! Good for access to all 220+ Club Pass Series shows all nine days of the festival. Can be shared and transferred. If you hesitated buying a Pass because you couldn't use it all three or nine days, now you can go in on the cost and share a Pass with friends. No photos or names appear on passes. Perfect for gifts, and customer and employee appreciation. Access 220+ Club Pass venue shows on any three days of the Festival at any Club Pass venue. If you hesitated buying a Pass because you couldn't use it for all three or nine days, now you can go in on the cost and share a Pass with friends. No refunds on any Club Pass purchase. If you don't have a Club Pass, you can enter any Club Pass Series show for $30 ($35 Kilbourn Hall), cash only, at the door. No advance tickets are sold for Club Pass Series Shows and there are no reserved seats. Entry is first-come, first-served for all, whether you pay cash at the door or have a Club Pass. Since venues may fill to capacity prior to shows so to ensure a better chance of a seat, arrive early and wait in line. Doors open 30 minutes before shows. See Club Pass Venues below. At the early shows at two of our busiest venues, Max of Eastman Place and Kilbourn Hall, we also offer a convenient Save Time in Line system. Check it out! "As always, the Club Pass acts are both new and familiar. The range of types of jazz is broad. All performances i attended were well worth the price of the Club Pass." “The club pass makes it possible to see a lot for a little. Great quality of music! 1. How and where do I pick up my pass? Club Pass tickets may be redeemed for a pass at the Ticket Shop when it opens on Monday, June 3, 2019 at noon and throughout the festival. You must get your pass and lanyard at the Ticket Shop before entering any venue. Tickets cannot be redeemed for passes at venues. 2. I haven't purchased a pass yet but plan to. 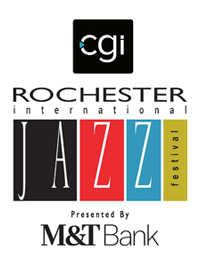 Do I still buy the pass at rochesterjazz.com? Yes. You can purchase a Club Pass online. Choose from 3 or 9 Day Passes, choose ticket delivery option and check out. Simple as that! All Passes are shareable and fully transferable. Redeem your ticket for a Pass at the Ticket Shop at 100 East Avenue starting June 3. 3. Can I use the Club Pass to go to a headliner show at Eastman Theatre? 4. I see people with a one-day paper Club Pass. How do I get one? Day passes are only available for sponsors and volunteers and are not for sale. You can still enter any Club Pass Series Show by paying the cover charge at the door, $30/35, first come, first served. 5. Can I loan my pass to someone if I am not able to use it? Yes! Please share your pass when you cannot use it. All Club Passes are now fully shareable and transferrable. Share the joy! 6. If I forget to bring my pass what do I do? You must bring your Pass with you to enter a show. Club Passes cannot be replaced. 7. If I lose my pass, will I be able to get a new one? Club Passes cannot be replaced if lost. Always wear your Pass on the lanyard provided. Please write your cell phone number on the Pass so that if it is lost and turned in to our Lost and Found (Ticket Office), we can notify you.